Left Center - 377 ft. Right Center - 377 ft. Initially constructed as a home field for Jersey City's International League affiliate of the New York Giants, the stadium later saw its most common use for high school football, as Jersey City's William L. Dickinson, James J. Ferris, Abraham Lincoln, Henry Snyder high schools and the city's major parochial schools, Hudson Catholic and St. Peter's Prep, all used the stadium, particularly on Thanksgiving Day, when Dickinson and St. Peter's would sell it out. It was the site, in September 1973, of the game that set the New Jersey state record for consecutive losses by a high school football team, when Dickinson High School lost to Hudson Catholic by the score of 22-0. 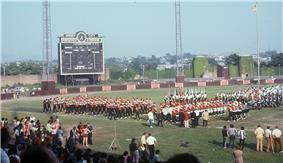 Jersey City State College (now New Jersey City University) played their home football games on Friday nights at Roosevelt stadium during the 1970s. It was used for 15 "home" games by the Brooklyn Dodgers during their last two seasons in Brooklyn - seven in 1956 and eight in 1957. The games were played partly as a negotiating tactic with the Borough of Brooklyn, in pursuit of a new stadium to replace Ebbets Field. While it had just 24,000 seats as opposed to Ebbets Field's 31,497, Roosevelt Stadium had 10,000 parking spaces compared to Ebbets Field's 700. 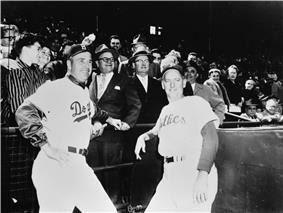 The Dodgers' negotiation came to naught, and the team moved to Los Angeles, California in 1958. The Giants finished first in the IL in 1939 and 1947, but no Jersey City team ever went on to win a pennant in postseason play. Hague routinely hawked opening day tickets for "Little Giants" games, selling 40,000 seats in a stadium that held only 24,000. When asked about the discrepancy, he was reported to have said, "Hell of a crowd in the men's rooms." 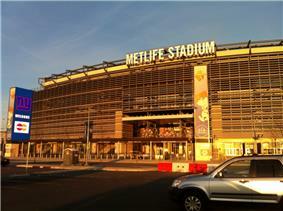 ^ "Jersey City Plans Stadium to Seat 50,000 As $500,000 Memorial to Her Soldier Dead.". New York Times. 1929-06-06. p. 21. 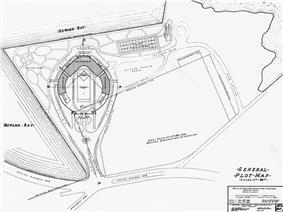 ^ "Jersey City to Get WPA Stadium Fund. 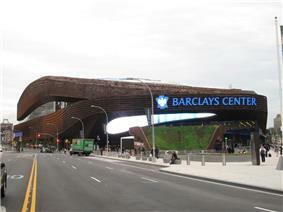 Mayor Hague Reports Application for $800,000 Approved for Arena at Airport.". New York Times. September 26, 1935. Retrieved 2007-08-21. Mayor Frank Hague of Jersey City announced yesterday he had been informed that the Works Progress Administration had approved the city's application for an $800,000 grant to build a municipal sports stadium. ^ "Two In Plane Escape In Newark Bay Crash. Schneider, Ex-Transcontinental Record-Holder, And Student Pilot Rescued By Police.". New York Times. May 16, 1935. Retrieved 2007-08-21. Two aviators escaped with only minor bruises and a thorough wetting last night when their three-seat, open-cockpit biplane developed motor trouble soon after taking off from the Jersey City Airport and fell into Newark Bay 200 feet off Droyer's Point, Jersey City. The men were rescued by police, who went to their aid in a collapsible rowboat kept at the field. ... The plane [had] taken off at 7 pm [piloted] by Edward Schneider, 23 years old, of 209 Sip Avenue, Jersey City, former holder of the junior transcontinental plane record and manager of the airport since January 1, 1935. ^ Kingsley Childs (1937-04-22). "International League to Begin Fifty-Fourth Season Today; JERSEY CITY READY FOR GALA OPENING". New York Times. ^ Arthur J. Daly (1937-04-23). "JERSEY CITY EAGER TO SEE NEW CLUB; Opener, Put Back Because of Rain, Is Expected to Draw 30,000 Fans Today". New York Times. p. 26. ^ "Doby Hits 500 Foot Homer for Griffith Stadium Record". ^ Stout, Glenn; Johnson, Richard A. (2004). The Dodgers: 120 years of Dodgers baseball. Houghton Mifflin Harcourt. p. 206. ^ Joseph Malinconico (1982-11-28). 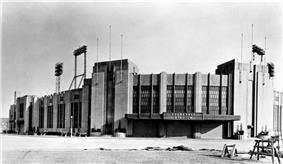 "ROOSEVELT STADIUM: GLORY FADING FAST". New York Times.